Six kits in limited run injection moulded plastic plus two separate kits. See details in body text. 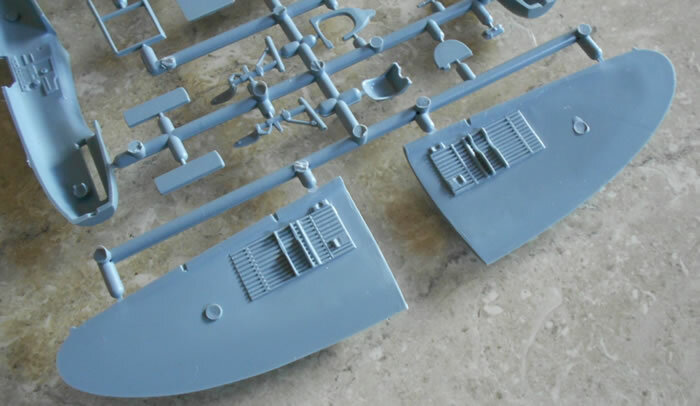 Advantages: A great variety of kits, nicely moulded with a pleasing standard of detail both moulded and in parts and with good decal choices across the range. None noted beyond a couple of instruction hiccoughs and the lack of locating pins associated with short-run kits. This is a pretty amazing collection of significant Italian fighters and their derivatives in the ‘one true scale’, all nicely moulded with a range of markings that should keep us all happy. From the feel of the plastic the sprues will need a good wash but we should all do that anyway. All I would do would be to flatten the tyres and add brake leads and a few cables in the wheel wells. This series should be well supported by modellers with an interest in Axis aircraft and I unreservedly commend them to you.. I shall review these kits as one since the basic parts are similar, although there are various fuselage and wing combinations across the airframes. 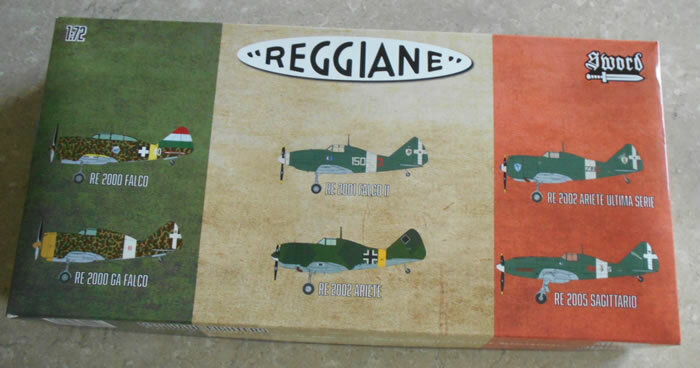 The Reggiane fighters were quite an attractive series of modern late 1930s all metal aircraft with retractable undercarriage and good flying characteristics and manoeuverability, armed with a pair of 12.7mm machine guns and the ability to tote a couple of small bombs in a tiny bomb-bay. This plane, like so many Italian aircraft of the period, was let down by inadequate engine technology and the non-sealing fuel tanks in the wings. Several engine types were tried with varied success and this range of kits exemplifies some of these. Service began in around late 1940 and various types saw service through to the end of WWII. Besides Italy, the two major users were Hungary and Sweden. The former received 70 from Italy and built 200 of their own as the Heja II (Hawk) while Sweden had 60 aircraft delivered and used them until 1946. 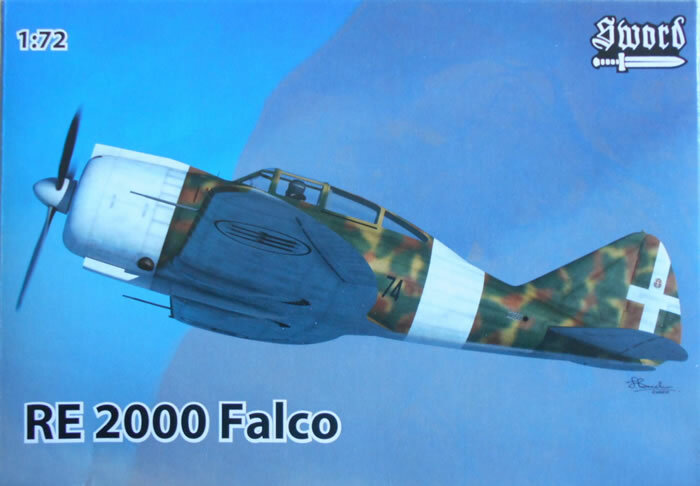 Improvements in engines and armament saw the series develop through the Re2001, Re2002, Re2003, Re2004 and the final Re2005 which was quite a capable fighter and used by the Luftwaffe as well as Italian fascist and co-belligerent forces. 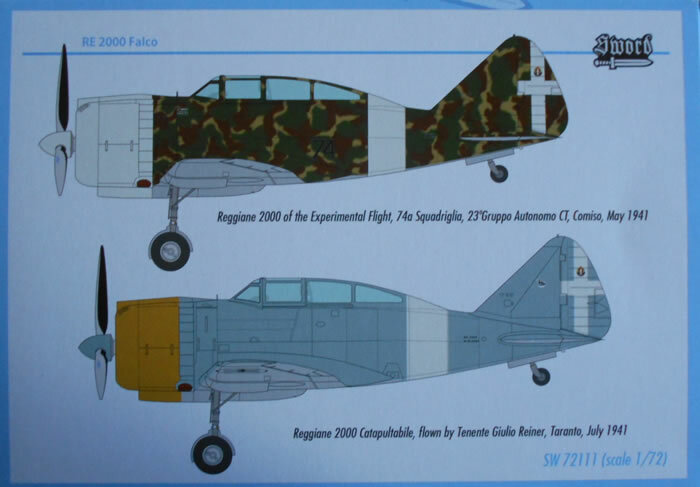 A small number of the early Re2000 Falcos were converted into catapultable aircraft and used on the only vessels in Italian service would carry aircraft (Littorio, Vittorio Veneto, and Roma - which could carry three each) but had to get back to land as they had no arrester gear and these were battle cruisers anyhow! It is amusing to note that these catapult versions were called the Ochetta , meaning Little Goose! Gotta love it! 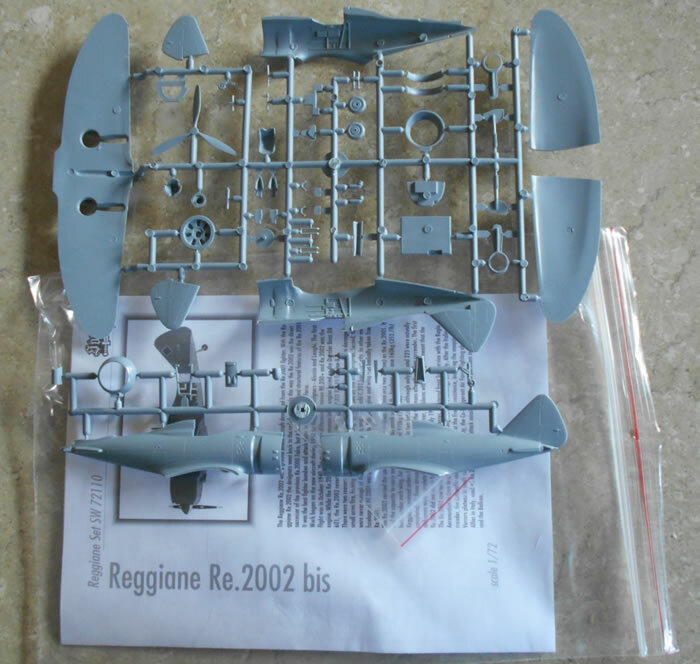 Previous kits of this series have been released by Italeri and Legato, but this is the first time the whole lot have been available to the modeller. 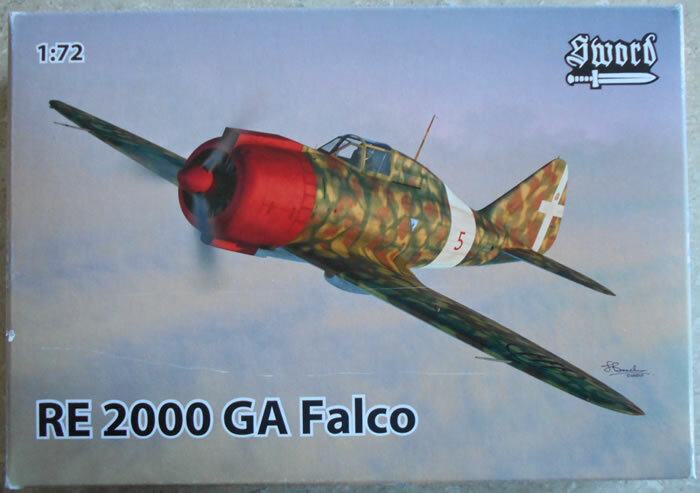 A nice painting of the Falco by S. Bianchi ( I think) is on the front of a fairly sturdy end-opening box contains a clip-lock bag with one dark grey plastic sprue, a small clear canopy/gunsight sprue, a 90x65mm decal sheet for two aircraft and a good instruction booklet. The rear of the box has colour drawings of the two decal choices. 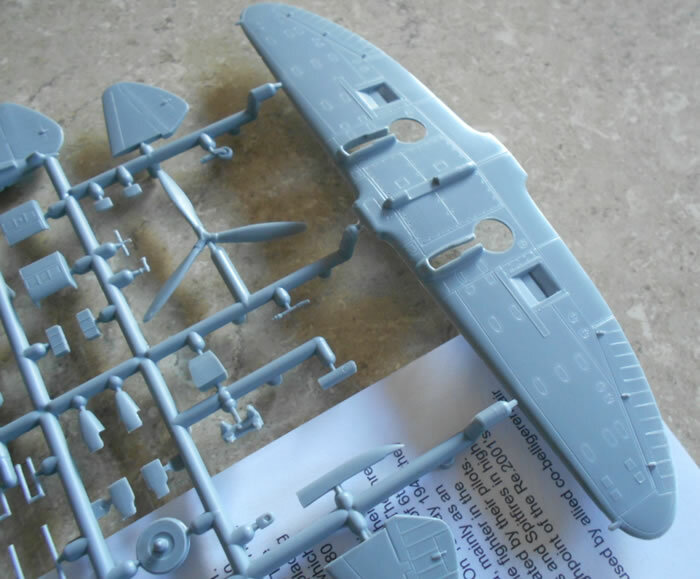 It is interesting to note that there are two tiny bits of sprue with a gearbox housing and an aerial which have been carefully cut off another kit’s sprue and added to the bag. The mind boggles at the time involved in this activity for a run of, say, 5000 kits! I can picture a mealtime conversation: “And what did you do at work today, dear?” “ Oh, I cut 5000 little bits of sprue on a production line and dropped them into bags!” And I thought marking 100 multiple-choice tests was boring! Anyway, the parts are nicely moulded with subtle panels and details on the surfaces and a nicely moulded cockpit detail on the inner fuselage walls. Control surface delineation is deeper than panel lines so look quite convincing. Flash was largely absent from the kits I examined and parts should go together well given the usual caveat of short run kits that have no location pins. There are a couple of whopping mould pips in the inner wings but they do not appear to restrict the joining of the surfaces. 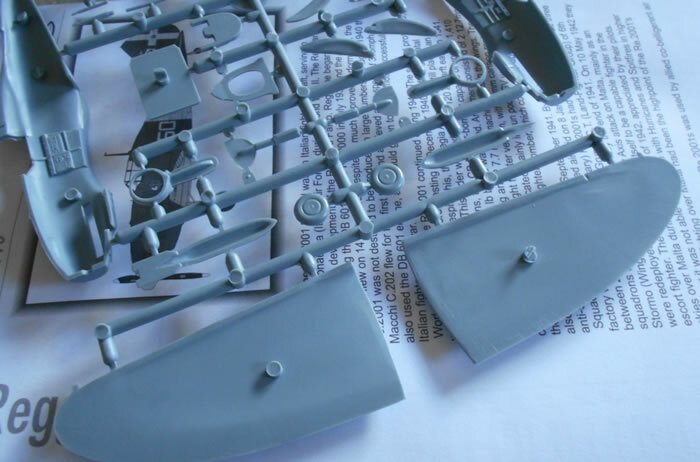 An interesting point is that for several of these versions the instructions show a multi-part canopy that allows an open one to be portrayed, and yet the canopy is a single moulding as shown here. 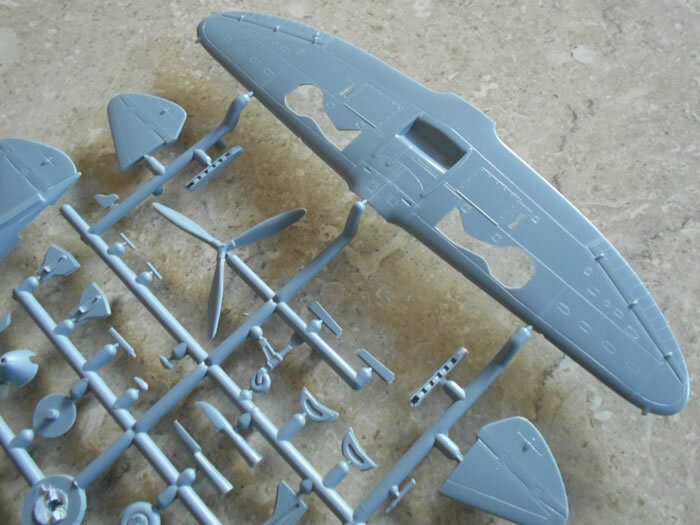 Detail parts are nicely moulded and include undercarriage well-walls and fuselage details that look really well done. the engine fronts are nicely done and will look good with little detail painting and some dry-brushing. an Re2000 Ochetta in mid blue-grey/pale grey with a yellow cowl at Taranto in July 1941 - curiously there are no camouflage notes in the instructions for this aircraft! Decals appear to be well-printed and colour density is good. An even nicer painting of this version adorns the box , again with two colour drawings on the rear. 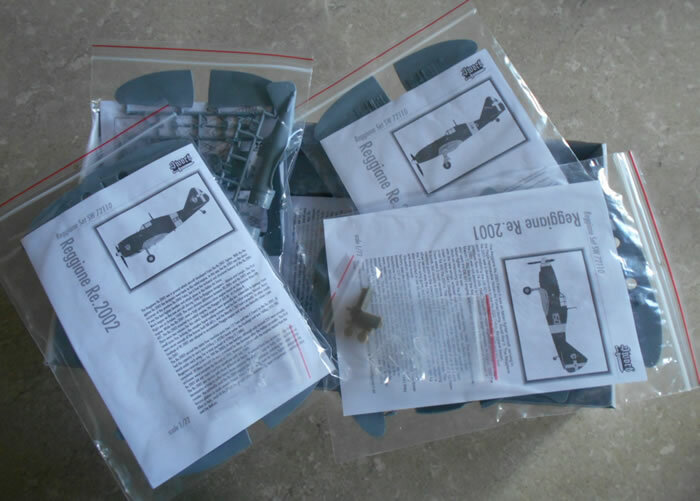 The same clip-lock bag contains all the parts from the version above but also includes new fuselage halves and the gearbox and aerial that were added to the kit above. This version of the Reggiane was designed as a long range one for the Regia Marina - the GA stood for Grande Autonomia and was meant to be able to fly to East Africa. The twelve airframes were modified by altering the rear deck and adding more fuel tanks to the tune of 340li. None were in their intended role before the Armistice with the Allies in September, 1943, but were available in 1942 for general fighting around Sicily and for coastal attacks with 377a Squadriglia. The modifications led to an aircraft that was even heavier and slower than its predecessor and was not welcomed by its users. The new fuselage halves are to the same pleasing standard as the kit above and include the modified rear fuselage deck and cockpit interior detail. The canopy is clear and is the correct cut back version. a sand/green/brown over pale grey camouflaged one with a red cowl. 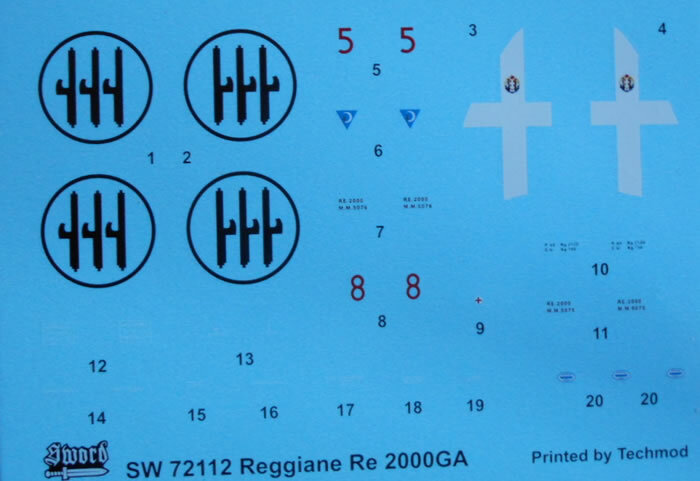 And that brings us to the Great Big Box ( kit number SW1110) which contains six versions of the Reggiane fighter, including both of the above kits. Now numbered on the instructions as SW1110, the Falco ( ex SW1111) appears in Hungarian markings so should be more correctly called a MÁVAG Héja (Hawk II), whilst the RE2000GA now sports camouflage as in version ‘b’ above, but with a yellow cowl and white rear fuselage band. 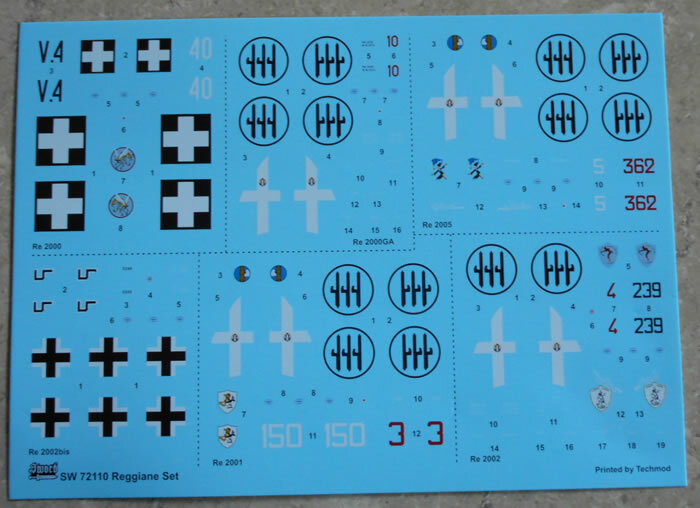 These decals are part of a large sheet for all six aircraft as shown. This large box is a strong top opening one with drawings of the six aircraft. This was an up-graded Reggiane with the German DB601 engine and its installation did little for the appearance of the design in my humble opinion. Somewhere around 240-250 aircraft were built in two versions, the CB fighter-bomber capable of carrying a 650kg bomb as well as machine guns, and the GV version which was a night fighter with 20mm cannon in pods under the wings. The wings are different from the Falco I as this version had underwing radiators. 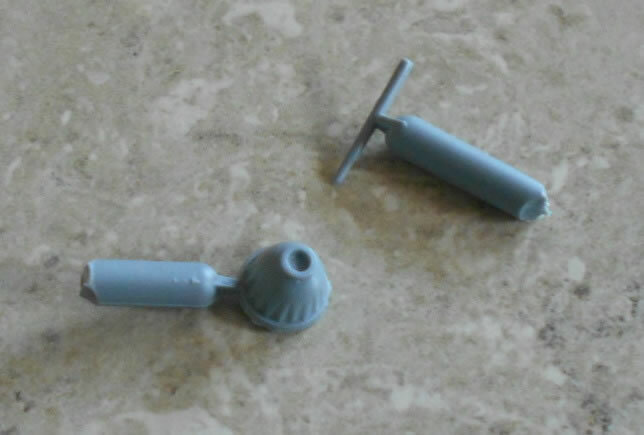 These are well moulded parts. 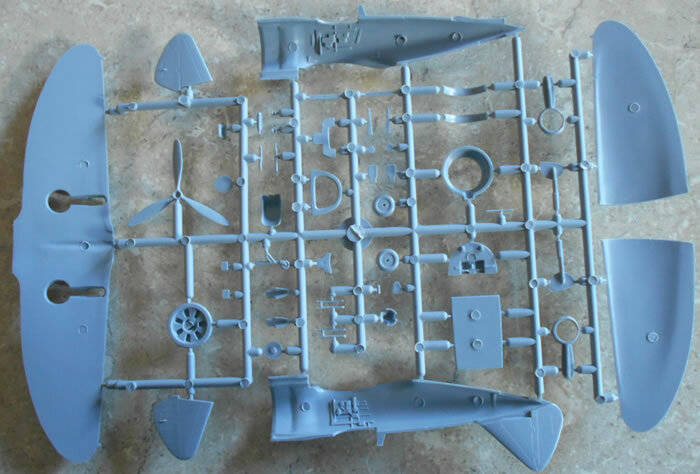 The pods and a bomb are included on the sprues but oddly are crossed out on the parts diagram and not shown in the instructions, even though the cover of these instructions clearly states that the two versions are included in the kit. 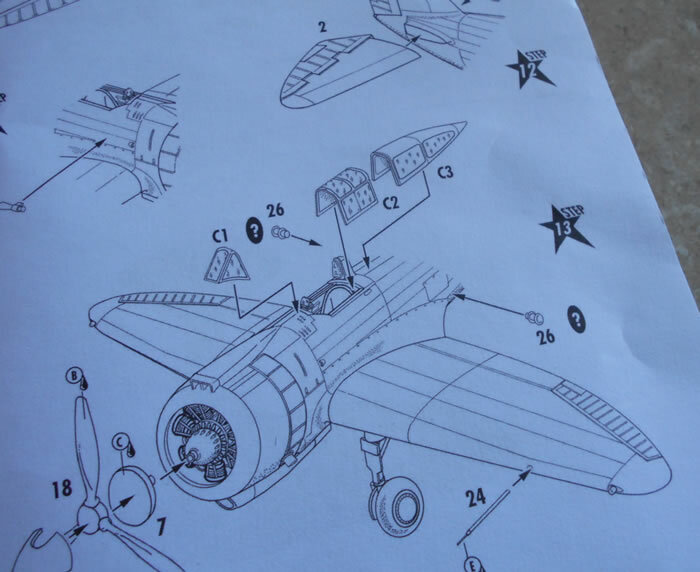 You will have to wing it from here but all the bits are there for the moderately able modeller, just ignore the instructions. 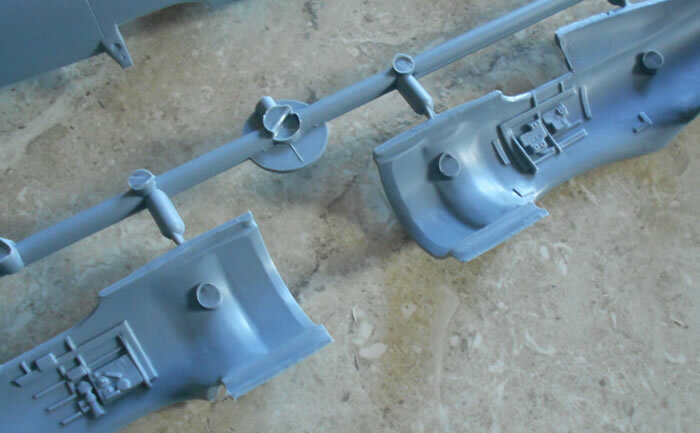 The canopy comes in four parts to allow it to be posed open and the kit includes resin wheels and exhausts. 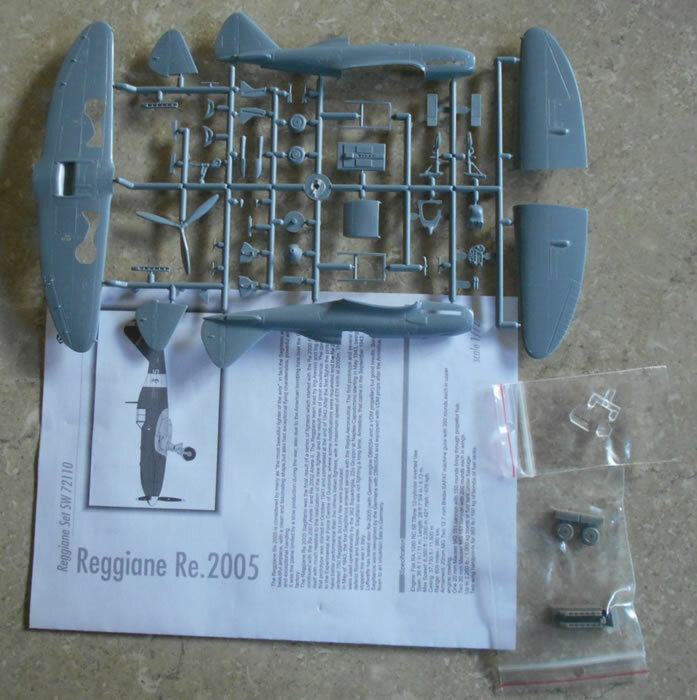 Decals are part of a large sheet as shown and for this version single in dark green over pale grey with a white fuselage band and nose of 150a Squadriglia , numbered 3/150 in the Italian style and with a nice badge on the fin. An attempt to turn the 2001 Falco II into a ground attack aircraft by returning to a radial engine that was apparently less vulnerable to ground fire. It could carry a 650kg bomb under the fuselage although this is not provided in the kit The resulting production run of around 225 airframes were regarded as Italy’s best GA aircraft of the war, and 75 went to the Luftwaffe after Armistice in 1943. The balance served with the Co-belligerent forces so there are a number of interesting markings that can be displayed on this model. 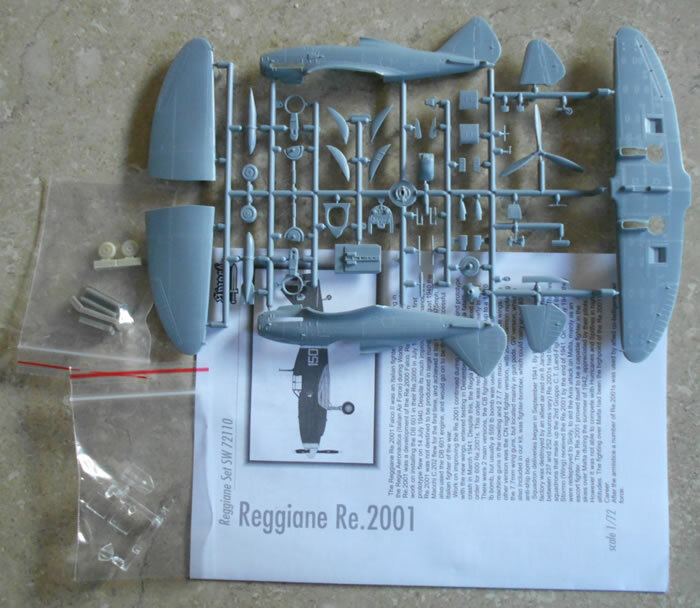 Moulded and presented to the same standard as the rest of the series, this kit comes with markings for a single dark green over pale grey example flown by the CO of 5° Stormo d’Assalto in August 1943. It has a white fuselage band and badges on both nose and fin for a bit of interest. This is an upgraded version of the 2002 and is the one that the Luftwaffe ‘inherited’ after the Italian capitulation to the Allies in September 1943, 75 of them being seconded to their forces. It featured a slightly different engine with additional protruding rocker-cover bulges on the cowling sides. This requires new fuselage halves which are provided in this kit along with all the parts, including the fuselage from the Re2002 above. 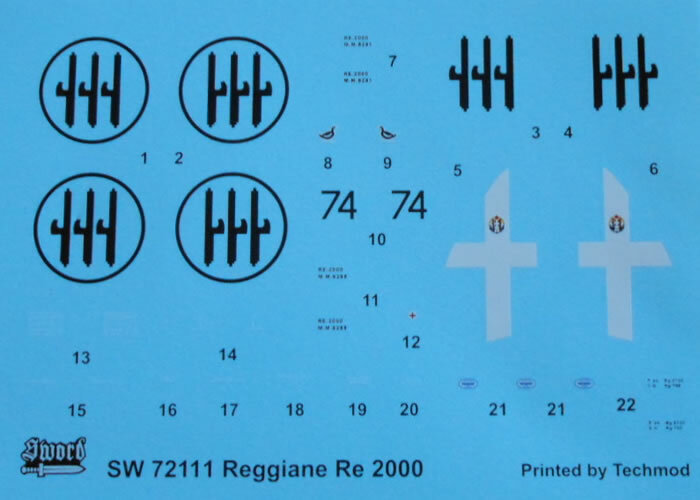 Decals are provided for a single machine in Luftwaffe colours of 70/71 over 76 with a gelb rear fuselage stripe. A full set of appropriate crosses are provide along with swastikas in two parts as per the norm these days, but no identification codes are supplied - maybe there were none? Reggiane finally got it right after many tries when they mated the German DB605A to the basically sound airframe and wings of the earlier types to produce what many people regard as the “most beautiful fighter of the Axis forces”. It had a clean shape, great flying characteristics, powerful armament and exceptional handling. Entering service in May 1943 its career was cut short by Italy’s capitulation in September of that year, and by Allied bombing of production factories. Only 48 made it to the fronts and some survivors went on to serve with the Luftwaffe in the defence of Berlin. This is a completely different airframe from the earlier Reggianes and, while an evolutionary development of that first Falco, this aircraft has different wings, fuselage and undercarriage from it. Only the tail feathers are the same. The wings have a large radiator built into the centre section, the undercarriage retracts sideways rather than rearwards, and the fuselage is slimmer and more elegant around the Daimler-Benz engine. 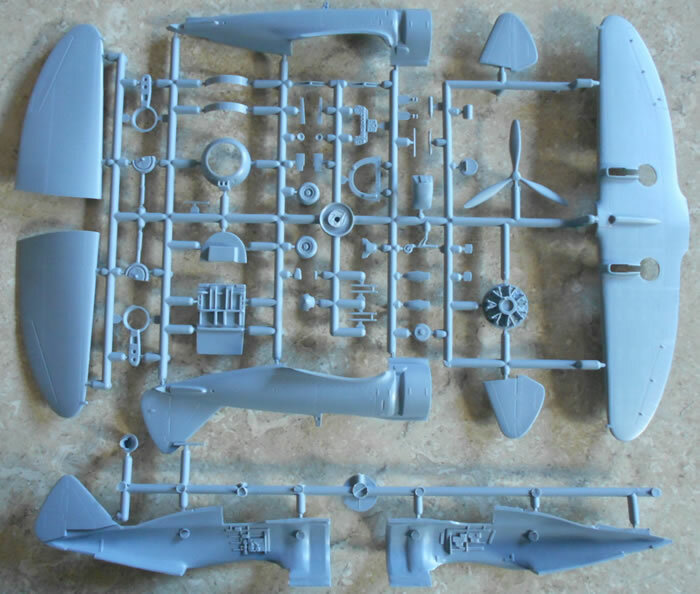 All of this is catered for with this kit, with the new fuselage and wings containing suitable wheel-well details and the new rotation direction for the u/c. Resin provides the wheels and exhausts and these are finely cast. 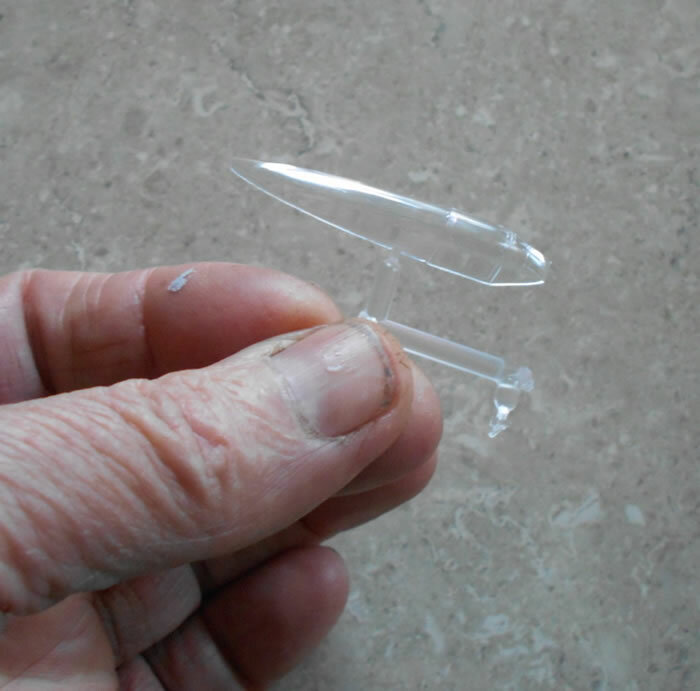 The clear canopy can be completed open or closed. I originally thought that the cockpit rear panel, part 36, had been short moulded but it is meant to have a gap like that. 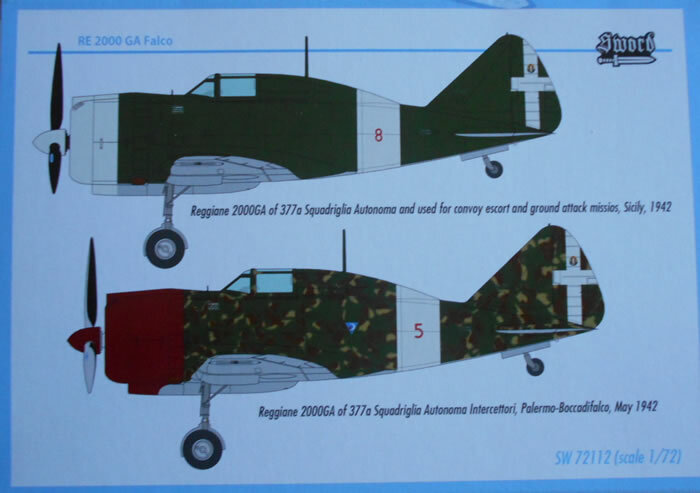 The single decal choice is for a dark green over pale grey example from 362a Squadriglia in Littoria in June 1943, again with a white rear fuselage band and a set of nice badges to enliven the scheme. This is a pretty amazing collection of significant Italian fighters and their derivatives in the ‘one true scale’, all nicely moulded with a range of markings that should keep us all happy. From the feel of the plastic the sprues will need a good wash but we should all do that anyway. All I would do would be to flatten the tyres and add brake leads and a few cables in the wheel wells. This series should be well supported by modellers with an interest in Axis aircraft and I unreservedly commend them to you.